Kathy has dedicated her education and career to helping people. She graduated from New Mexico State University in 2006. Her degree is in Family and Consumer Sciences, an emphasis in Family and Child Science, and a minor in Counseling and Educational Psychology. In 2016 she earned a Family Infant Studies certificate from Central New Mexico College to further her knowledge of child development and study how the role of relationships with parents impacts young children. She holds a level two endorsement in Infant Mental Health which she earned in 2017. Kathy brings to First Steps over 10 years of experience working in case management, behavioral health, with teens, and in early intervention. 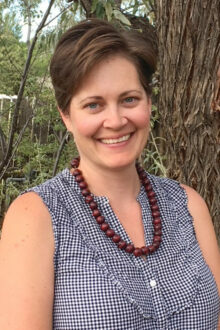 Born and raised in southern New Mexico, Kathy moved to Taos in 2012 with her husband. Kathy knows the challenge of balancing work and parenting as the proud mom of two young children who keep her busy, happy, and tired. When not packing lunches or dropping off kiddos, Kathy enjoys a good laugh and chat with friends, playing yard games, and exploring the mountains.